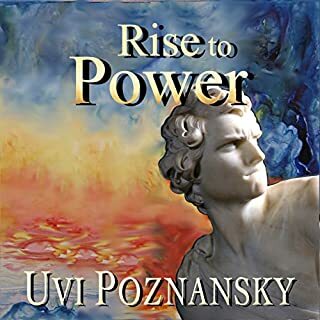 Rise to Power: The David Chronicles, Volume 1 by Uvi Poznansky. The narration is provided by David George. Many people that know nothing of religion know of the tale of David and Goliath. This is that David. This is the man in his elders years remembering his life and how he came to power. For those that fear an audiobook preaching religion to them, this performance is not that. This is more of a modern re-telling as David recounts his life and deeds. Told in Ms. Poznansky’s beautiful lyrical prose that flows amazingly from the narrator. King David recounts his youthful days in the court of King Saul through his Rise to Power told only the amazing way the Ms. Poznansky can tell a story. Ms. Pozanansky has taken a basis in biblical fact and tradition and expanded it into a greater story. Enriching the world and characters by filling in gaps in the biblical narrative. This story held my attention through the entire performance. I was very familiar with the story of David but still was highly entertained and enjoyed the way David characters complex personality and his internal struggle with himself and others are portrayed. The narration by Mr. George was simply outstanding. His characters were enjoyable and his David was amazing. Mr. George made changes in David’s voicing as he ages that was subtle but showed a truly impressive attention to detail. The audiobook was produced by Ms. Uvi Poznansky. The entire production was crisp and clear through the entire performance. I was given this free review copy audiobook at my request and have voluntarily left this review.